UPDATE: TLS Girls 6th and Under team came in 5th out of 100 state teams this year. Runner of the Year: Kate Conklin, The Lexington School. Coach of the Year: Jim Kaiser, The Lexington School. All Area Team: Kate Conklin and Caroline Beiting, The Lexington School. TLS Cross Country is the real deal. It’s more than a dirt path at The Lexington School’s 12th Annual TLS Cross Country Invitational. It’s winding, narrow channels up and down soft grassy knolls, a creek jump, hay bails, mulch paths through woods, over gravel, across a bridge to a final ascent to the finish line chute. THIS is a cross country course that happens to be in The Lexington School’s backyard. THIS is the real thing. Jim Kaiser sets up and times cross country meets all over the country, and he is meticulous. He manages entries and all aspects of the meet. The cross country course at The Lexington School requires a full-day of setup for marking courses, making paths clear, preparing safe creek and hay bail jumps, and preparing the finish chute with professional timing equipment. Add a hospitality element which includes water stands, a hospitality tent with food for all 600 runners, a snow cone truck for that cold, sweet reward, and you have a special event unlike any in central Kentucky. 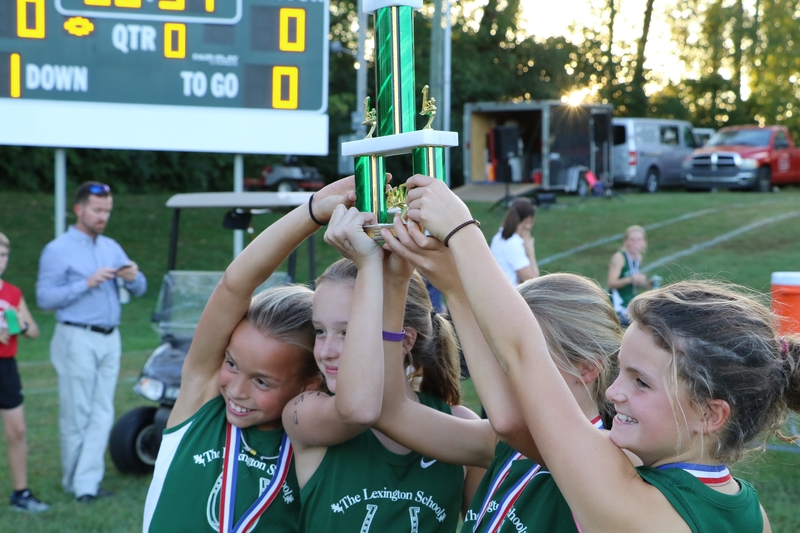 It just so happens that Lexington School runners perform very well in their own backyard. This year the elementary girls team had a huge first place win with 5 girls in the top 15 and a total score of 27 points. The 2nd place team came in at a distant 110 points. These top scoring runners are recognized: Kate Conklin, Caroline Beiting, Eva Quinn, Laura B Friesen, and Katherine Monohan. The middle school girls team brought home a third place trophy as well. For a full gallery of downloadable photos (yes there are more), go HERE to our album on Flickr.